In the previous articles, I explained what does contango mean, what the VIX index is, and how some ETF / ETNs work in the volatile markets. I have focused mainly on the inefficiencies which are brought by such construction and which can be very interesting for our trading. In today’s article, I would like to follow up on this topic and show you other markets where such inefficiencies can be observed, especially the commodity markets. As you can see from the following chart, and despite the fact that the VIX index is quite clearly dominating the contest of the markets with highest average annual contango, other markets are worth further exploration too. 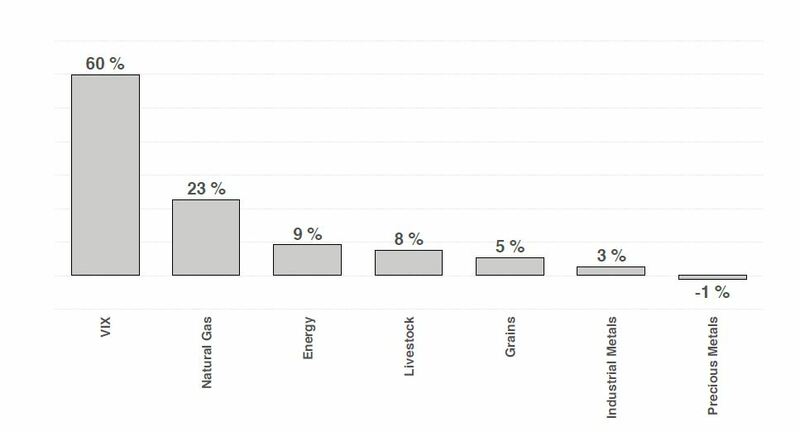 The best-known commodity sectors can be seen in the following comparison, which shows you what was the average annual contango in these markets over the past 10 years. In the following comparison, you will find the more detailed list of commodity markets, again compared to the average annual contango. The second place: natural gas is certainly interesting, also because, and unlike the VIX, the gas market is not in a fundamentally underestimated state. From my point of view, it is a very interesting candidate to the portfolio and I will continue to talk about. There is a whole range of ETFs available, including leveraged ETFs. The third place – lean hogs are also interesting. Here, however, we have the problem with a suitable ETF that could be traded through options as well as with sufficient liquidity. 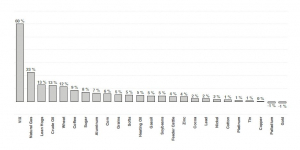 The fourth place – oil, is not so much surprising. As in the case of gas, there are many very interesting and liquid ETFs (through USO, SCO, UCO, etc.). After all, I have talked about the oil trading system at the Czech Investment Conference last year. At this point, however, I am decreasing the participation of the oil in the portfolio compared to natural gas strategies. 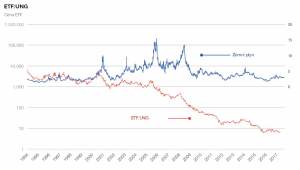 In this article, I want to introduce you the ETF: UNG, which, thanks to its mechanism of operation gives to investors a very interesting opportunity to trade the natural gas market. The principle of this ETF is relatively simple – this ETF keeps its exposure to the natural gas market at the nearest (front) month. Because its goal is to maintain the exposure on the closest contract, it must, therefore, sell the nearest futures contract every month and roll over to the next one, ie buy the following contract. And as you already know from the previous article, contango is the reason why the fund sells the front contract for a cheap price and buys the following expensive contract. And, of course, in a situation where contango reaches a few percent only on a month-to-month basis, the price of this ETF is falling sharply, as a result of the strong contango existence. 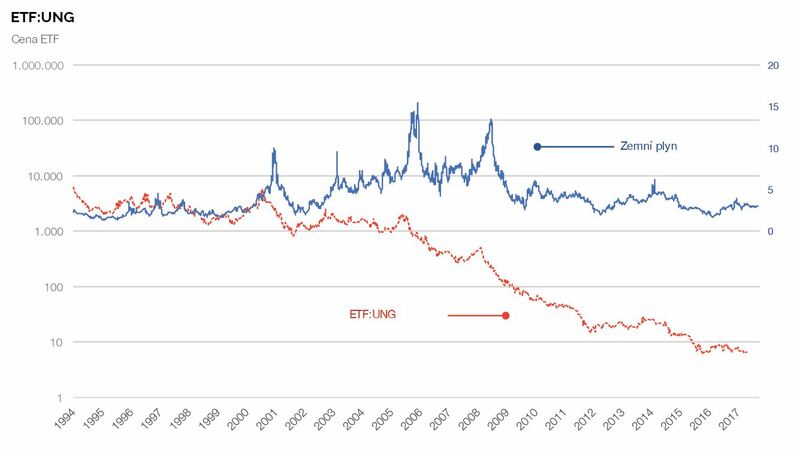 The following graph shows the comparison of the natural gas price and the ETF: UNG. It is very clearly visible how much contango contributes to the inefficiency and fall of the UNG price compared to the underlying asset. Especially in the longer term, this difference is very clear. Twenty years of contango caused that the ETF: UNG dropped from roughly $ 10,000 to the current US $ 6. To fully capture the value of this decline, it is needed to rebalance the shorted volume so that it still forms the minimum % portion of the portfolio. So, how the contango phenomenon in commodity ETFs can be used in trading? As an example, I would like to put down a situation where we want to speculate on the drop (going short) in natural gas market – no matter whether from a fundamental point of view or according to technical analysis. We leave trading approach aside this time. The advantage of this ETF and its construction is, that in a situation where the market is dominated by contango, and you speculate on the decline of such a market, its construction gives you an additional “cushion” in the price movement against you. Simply put – if the market is in 5% contango and the spot price for natural gas does not move even a dollar down, your short position on this ETF will still be around 5% in plus, and we talk just about the one-month horizon. Even with a relatively low average contango of 2 percent monthly, we are getting to a decline on an annual basis around 20-25%, which is certainly not negligible for long-term investors. In the next part of this series, I will make an introduction to leveraged ETFs. We will talk about opportunities offered here, and how much is the leverage associated with the “tracking-error” effect and how this has a huge impact on the disintegration of these ETFs and how that creates interesting trading opportunities for us.